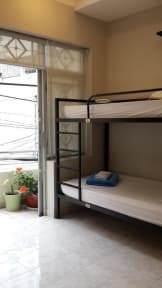 虽然是hostel但是服务已经到了hotel的级别了!!!!! 交通很方便一出门就是公交车总站，虽然在背包客街但是在小巷子里还挺安静。推五楼的混合住宿，虽然楼层高而且要自己爬，没电梯，但是很安静很享受的睡眠质量!!! (除非同房有打呼噜的....但这就不是旅店的错了XD) 每天都会帮你整理床铺，清理地板之类的。根本就是酒店的客房服务啊，住了五个晚上没有看到蟑螂和其他怪虫子，可见算是干净的! 早餐也很丰富，晚上也可以大家一起聊天，员工也很友善，总之是物超所值!!!! perfect place in 5th floor mix room! Although it is hostel but it already reached the hotel service level. Transportation is perfect, near to the bus station. Super clean and everyday they will make your bed and clean the room. Enjoyable stay! It's a popular hostel offers valuable price and surprisingly includes breakfast and happy hour. Nothing to complain. Long Hostel is definitely a good place to stay in Ho Chi minh City. It is located at the end of the backpacker Street so it is a quiet area for you to take a rest. Free breakfast and free beer are also provided. The staff is friendly and helpful as well. 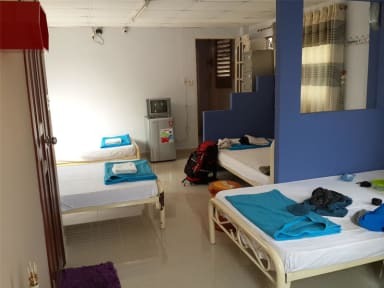 The atmosphere in hostel is so welcoming that you can meet and socialise with other travellers. The only drawback is that there is no stable hot water in the shower.